In the beginning, clients often tell me they think writing is hard work. Do you know how flush is defined? “A rushing or overspreading flow. A sudden rise of emotion or excitement. Wow. What writer wouldn’t want that? Writing is only a chore or a bore when you over-think it. From now on, don’t write when you’re grinding; write when you’re glowing. Writing is joyous when you’ve just observed or experienced something different, something intense – and you’re simply transferring the aha’s running through your mind onto paper. 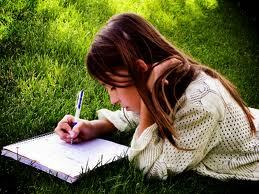 The thing is, many of us are busy so we set aside a time to write. We sit down at the appointed hour and expect flow to show up, on command. Flow doesn’t like to take orders. It happens IN THE MOMENT. It happens when we’re one with something that just happened and the miracle of it is filling our mind, soul and spirit. That’s when we need to sit down and write. When those exquisite moments happen, we need to GO WITH THAT FLOW or it disappears. Next time, you see something, feel something, understand something as if for the first time … and your mind starts racing with epiphanies … honor them. Sit down (even though you have ‘other things to do) and get those thoughts out of your head and onto the screen or notepad … as fast as you can. Let what wants to be said come out in a vigorous rush … because what’s coming out is alive. It may not be grammatically perfect … but it will have a voice, a passion, a pithy purity that only results when we’re swept up in what wants to be said. When we do that, when we get out of the way and facilitate what wants to be said along its way, we collaborate with the muse. It may sound grandiose, but writing those thoughts down in the moment is a way to render them immortal. When we are in that pure state of flow, we are simply the conduit for whatever insights are blossoming within us. We are merely the messenger and our role is to get those thoughts out of our head (where they serve only us) and into the world (where they have the opportunity to serve many). You know you’re getting this “right,” when you look at what you’ve written and it’s better than you know how. So, if you want writing to be a blessing instead of a burden; if you want to be at your intriguing best, write in the FLUSH of the moment to free up FLOW. They don’t call them fleeting thoughts for nothing. Next time you experience something that gets your juices flowing, get going. Actually, sit down and let what wants to be said …. get said. A client emailed me to say she was having a hard time making progress on her book. I sent her the following message – and thought it might have value for you if you’d like to get in that delightful stream-of-conscious state where the words are flowing out of your head so fast your fingers can hardly keep up. (Name of client) . .. please keep giving yourself props for writing, writing, writing. E.L. Doctorow was asked what it was like writing a book. Keep driving to the end of your headlights. Keep producing pages and getting your thoughts on paper. They don’t have to be perfect and they don’t have to be right. Just getting your thoughts down will trigger more – which will trigger more – and before you know it, your book is out of your head and on paper. THEN – you can go back and start cleaning it up. Don’t try to think up what you want to say. That keeps you in your head. Blocked. Stymied. Just get your thoughts written down. That keeps you moving forward. That produces a momentum where your writing takes on a life and pace of its own. All the best-selling authors at Maui Writers Conference – from Mitch Albom to Frank McCourt to Nicholas Sparks to James Rollins to Jacquelyn Mitchard – agreed. Jot the thoughts when they’re hot. Muse it or you’ll lose it. If writing is hard, it’s because you’re thinking too hard. Get out in nature. Go somewhere the sun is shining. Fill yourself with the fresh air of a beautiful day, the serenity of deep, calm water, the eternal beauty of green trees or a sweeping vista of towering mountains. Drink in the quiet but powerful energy of that place. “What do I passionately believe? What do I feel is important? What have I learned – the hard way – that might have value for others? Who is my target reader? What is that person’s name? What is their story? Man? Woman? Married? Single? Kids? Working 60 hours a week? Out-of-work? What are they going through? What’s keeping them up at night? What are their doubts, fears, hopes, dreams? What could I share that would keep them going, help them deal with their challenges, put hope in their heart? Fill your mind with that person. Picture him or her in front of you. Now, reach out to that individual with your words. Put your pen to paper – your fingers to keys – reach down into your gut – and start writing to THEM. Pour out your heart, mind, soul and insights to THEM. Make writing a outreach to that man or woman. No fancy language. No struggling how to say it just so. Write and reach out to them with your words until you see the light go on in their eyes. Write to share what you know, beleive and feel in a way that might add value for anyone reading your words. When you do that, you free yourself up to to serve.